Two years have passed since Yamaha presented an objet representation of a new VMAX at the 39th Tokyo Motor Show, and during this time we have continued development efforts aimed at constantly higher goals in the quest to create a new VMAX that will exceed your expectations. 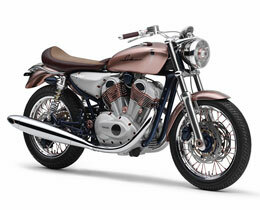 That New VMAX is on the verge of being born from the model of Yamaha's "rider-machine communication" ideal. 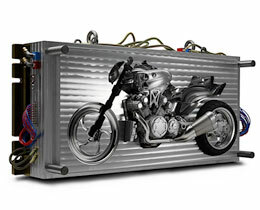 This work of art based on the theme of "Awakens" is a symbol of our determination to bring that New VMAX to life. "XS-V1 Sakura" is a symbol of our long-nurtured corporate philosophy. This is a V-twin sport model with a look of "Japanese style" in the image of Yamaha's first 4-stroke model, the XS-1 (650cc), released in 1970. Its design is full of XS-1 DNA, in its simplicity and functional beauty and finds new refinement in a retro-modern aesthetic. It is a model that proposes a very Yamaha and very Japanese vision of premium motorcycling life, bringing together the unique characteristics of a 1,000cc air-cooled, V-twin model with its strong pulse feeling and easy-going running performance in a finely crafted body that is lightweight and slim and defined by a low seat height. *Sakura is the Japanese word for cherry blossoms. 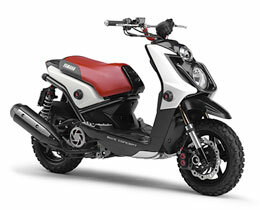 This stylish variation on the BW's scooter features large-diameter block-pattern tires and special high-spec parts in the front and rear suspensions and brakes plus a wild and tough design that projects an off-road image. The result is a fun-filled commuter bike that brings excitement into everyday riding.